For some reason, the case for ClearBank.co took longer to decide. In this case, the Respondent did not even respond! Christopher J. Pibus, sole panelist at the WIPO pointed out that the domain ClearBank.co was registered in 2013, years before the incorporation of the Complainant’s company, and the registration of the Complainant’s marks. For this reason, ClearBank.co was ordered to remain with the Respondent. The Complainant is ClearBank Limited of London, United Kingdom, represented by Lawdit Solicitors Limited, United Kingdom. The Respondent is Curtiss Pope of Milpitas, California, United States of America (“United States” or “U.S.”). The disputed domain name <clearbank.co> is registered with GoDaddy.com, LLC (the “Registrar”). The Complaint was filed with the WIPO Arbitration and Mediation Center (the “Center”) on October 31, 2018. On October 31, 2018, the Center transmitted by email to the Registrar a request for registrar verification in connection with the disputed domain name. On November 1, 2018, the Registrar transmitted by email to the Center its verification response confirming that the Respondent is listed as the registrant and providing the contact details. In accordance with the Rules, paragraphs 2 and 4, the Center formally notified the Respondent of the Complaint, and the proceedings commenced on November 8, 2018. In accordance with the Rules, paragraph 5, the due date for Response was November 28, 2018. The Respondent did not submit any formal response. Accordingly, the Center notified the Respondent’s default on November 29, 2018. The Center received informal communications from the Respondent on November 29, 2018, December 5, 2018, and January 2, 2018. The proceeding was suspended December 6, 2018, and reinstituted January 9, 2019, in accordance with the Rules, paragraph 17. The Center appointed Christopher J. Pibus as the sole panelist in this matter on January 17, 2019. The Panel finds that it was properly constituted. The Panel has submitted the Statement of Acceptance and Declaration of Impartiality and Independence, as required by the Center to ensure compliance with the Rules, paragraph 7. The Complainant was incorporated in 2015 and operates a clearing bank in the United Kingdom. The Complainant has used and licensed others to use the name ClearBank as a brand name for banking services and on print media and the Internet. The Complainant has used the domain name “www.clear.bank” in association with its banking services. The Complainant has invested GBP 388,964 on advertising in 2017 and an additional GBP 538,669 on advertising in 2018. European Union Trademark Registration No. 016245847 for CLEAR.BANK Design dated May 2, 2017. The disputed domain name <clearbank.co> was registered on April 28, 2013. The Complainant alleges that the disputed domain name wholly incorporates the Complainant’s registered trademark CLEARBANK. The addition of the designation “.co” does not serve to distinguish the disputed domain name from the Complainant’s registered trademark. Accordingly, the disputed domain name is confusingly similar to the Complainant’s trademark. The Complainant contends that the Respondent is not known by the name ClearBank, and has not been authorized by the Complainant to use the trademark CLEARBANK. The Respondent has not used the disputed domain name in association with a bona fide offering of goods and services. The disputed domain name has been used in association with a website which provides links to third party websites which are direct competition with the Complainant. The Complainant further submits that the Respondent has registered and used the disputed domain name in bad faith. The disputed domain name is confusingly similar to the Complainant’s registered trademark and is being used in association with a website that features links to third party websites which are in direct competition with the Complainant for purposes of monetary gain. The Respondent’s ownership and use of the disputed domain name is also interfering with the Complainant’s business. As set out above, the Complainant does own a set of trademark registrations for CLEARBANK, the earliest of which dates back to May 30, 2016 (European Union Registration 015011141). The Complainant’s business was incorporated in 2015. Accordingly, it is clear that the Complainant holds rights in the trademark CLEARBANK, and that the disputed domain name is identical to the trademark in question. However, as noted below with respect to bad faith, the Complainant’s rights are belated in nature, for purpose of the third element analysis, because the domain name itself was registered on April 4, 2013, long before any of the Complainant’s trademarks were registered, and before the Complainant’s business had even been incorporated. In light of the findings on bad faith, it is not necessary for the Panel to make findings with respect to rights or legitimate interests. The chronology in this matter makes it clear that the disputed domain name could not have been registered in bad faith, because no relevant trademark rights yet existed when the original registration took place in April, 2013. A domain name registered prior to a complainant’s trademark by a significant length of time (such as two years) cannot constitute an abusive registration unless there are strong countervailing circumstances (such as long standing common law use of the mark and pre-existing reputation arising therefrom). In the circumstances of this matter, there are no countervailing facts which assist the Complainant. In fact, it appears that any common law rights which did exist must have arisen after incorporation of the Complainant’s business in 2015, which was significantly later than the date of registration for the disputed domain name. This is an example of a complaint which can be characterized as an opportunistic scheme to acquire an obviously attractive domain name without having evidence to support the critical elements of the claim. The chronology of evidence ought to have alerted the Complainant that this case was doomed to failure. The Complainant has failed to satisfy the Panel with respect to the bad faith, and accordingly this Complaint is denied. What were these Lawdit lawyers thinking? 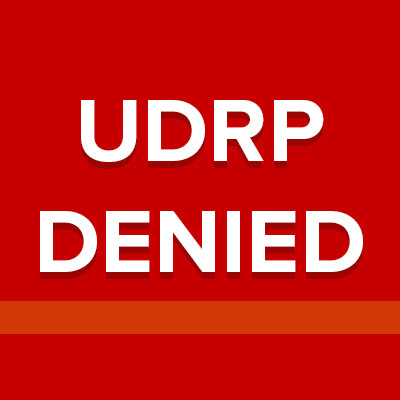 Can they not read the UDRP policy requirements to win?